Discover the principles of letting go of resentment so you can enjoy the beauty of life. I love to sing. As it is for every singer, there are some notes that are out of my range. When I reach my highest note and push hard to go one or two notes higher, I can’t do it. One day, a friend noticed that when I tried to hit the higher notes, I was not breathing through my diaphragm. I immediately changed my breathing and voila! My range expanded by three notes. It was easy. Maturing psychologically— letting go of resentment so as to appreciate life’s beauty and the blessings in our lives—is often attempted in a similar, misguided manner. We strain to talk ourselves out of a negative emotion, such as anger, while nonetheless still feeling that emotion strongly. We use anger-reducing strategies that work only temporarily, such as counting to 10 before we speak, or convincing ourselves that the issue is NOT worth getting upset about. We distract ourselves with more pleasant things. Or we strike back, hoping to reduce our resentment by settling a score. All strategies that focus only on your anger will be a temporary fix and eventually fail. That’s because most people try to “fight” their anger or “push it to one side”, creating unnecessary tension. Besides, anger is not the source of your problem. The REAL problem is that you are living by a set of principles that are obstacles to true growth – and don’t realize it. Embrace the following principles and your anger will subside more naturally without having to be forced out. You will be able to sing the higher notes—that is, experience more joy, gratitude, trust, patience, love, and inner peace—naturally, and without straining. Principle #1: Growth that is transformational is an outgrowth of experiencing great love or great suffering. In other words, the hurts that gave rise to your anger are essential factors in your personal growth. Hurt and pain create suffering. But without suffering, we don’t fully appreciate the good in our lives. We don’t have a need to integrate the highest ideals of forgiveness, tolerance, and compassion. We are like moths that must experience the flame. The moth symbolizes our soul seeking spiritual truths, but having to go through tribulation first. Principle #2: Anger and resentment stems from unresolved sadness and loss. When you feel a loss in any of those areas, it creates hurt or sadness. Many times, we do not notice the sadness and go immediately to anger. The goal is to stay with the sadness—it is a clean emotion—and endeavor to strengthen areas where you feel weakened. Principle #3: To go from anger and fear to the higher states of beauty, peace, and trust, we must cross a bridge. That bridge is called “emotional acceptance.” Too often, we do NOT accept the reality of what occurred – we resist it. “This should not have happened!” we say. Or we cry “What would make a person DO that?” Such questions are really a form of avoidance. We do NOT wish to accept the reality of what happened. 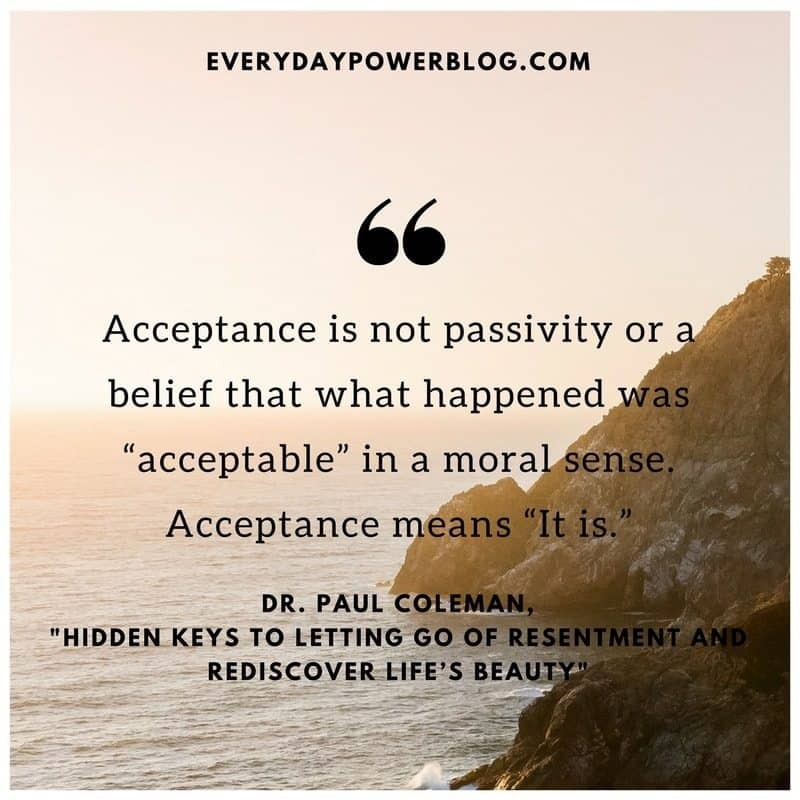 Acceptance is not passivity or a belief that what happened was “acceptable” in a moral sense. Acceptance means “It is.” Resisting emotional acceptance leads to more internal pain, such as resentment. This is why letting go of resentment is difficult for most of us. Principle #4: Acceptance plus trust leads to peace. Peace helps us see beauty that is already there. I’m not saying you should trust that all will work out the way you wish. I’m not saying to trust that all goodwill come your way. 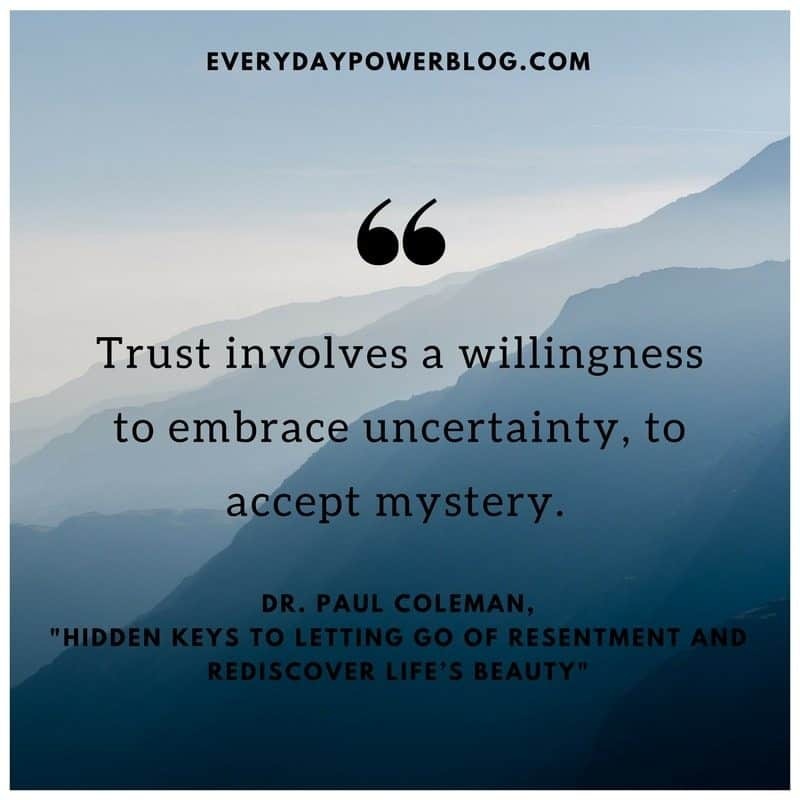 Trust involves a willingness to embrace uncertainty, to accept mystery. When you insist on getting to the bottom of WHY things happen (the “cosmic” why, not the scientific why), when you want an answer and you want it now, you set yourself up to a never-ending internal debate that will lead to fear or frustration. But if you open yourself to mystery, if you consider that perhaps you are NOT the sole author of your life, that co-authors exist; if you consider that you are in this world to serve many purposes and not all of your reasons-for-being have been achieved, you can tolerate NOT knowing. Acceptance plus trust allows you to peacefully co-exist with not-knowing. This helps in letting go of resentment and the belief that events MUST happen the way we want them to, or that some things should not happen – when in fact, they did. Principle #5: Do not try to “beat up” negative thoughts with positive thoughts. Allow the positive and negative thoughts to co-exist without debate. Then live your life in between them. Positive thinking does not always work when hurts or losses are profound. That is because any positive thought (i.e. “I will find a way to cope after my spouse died.”) can always be followed by a negative thought (“But I’m furious at God for allowing it to happen!”), and the resulting inner debate depletes you (“I shouldn’t be angry at God…But I AM! But I shouldn’t…”). Instead, acknowledge the parts of you that thinks and feels one way and another. Accept those differences without debate and move forward with your life. Eventually, the thoughts that don’t serve you will slip away on their own. But if you attempt to force them out, they remain. Principle #6: There is a hidden sadness to all that is beautiful, and a hidden beauty to all that is sad. We love our family and friends. But eventually, someone dies or moves away. We are happy at our child’s graduation or wedding, but shed a tear as well. We may stand in awe on a beach gazing at the ocean, but eventually, we have to leave and go to someplace uninspiring. Many noble causes that have helped thousands of people began as a result of someone suffering a loss or injustice. As you embrace these principles of letting go of resentment, you will discover that anger—while normal—sheds itself naturally, like a tree shedding its leaves in autumn, without you having to force it. As your resentment subsides, the beauty of life—which is ever-present and ever-visible—is revealed to you anew. 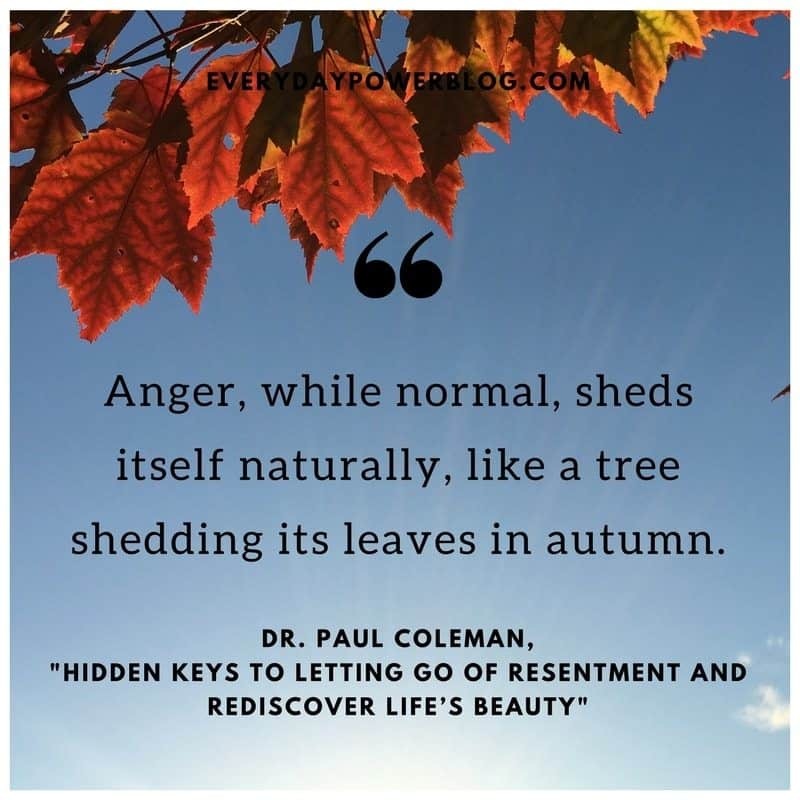 The post Hidden Keys to Letting Go of Resentment and Rediscover Life’s Beauty appeared first on Everyday Power.